After more than three weeks of ducking rain, my weather luck finally ran out. 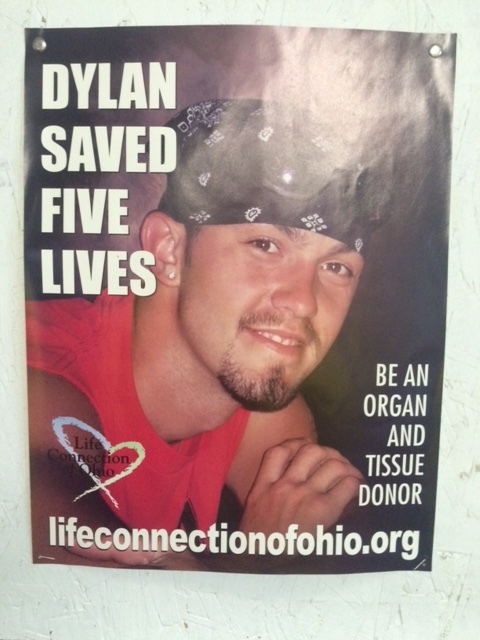 I slept for eleven hours in Cathy and Don Mayles’ quiet basement, and enjoyed a huge breakfast with them before heading out in a light mist about 11 a.m. Before I left they described that a friend whose son died young but donated his organs is tracking where people see this poster on trucks. If you find one, let me know and I’ll pass the news on to Cathy and Don. The mist dissipated after I stopped by CVS for provisions, so I was hopeful for an easy ride. The stretch to Monroeville was uneventful. 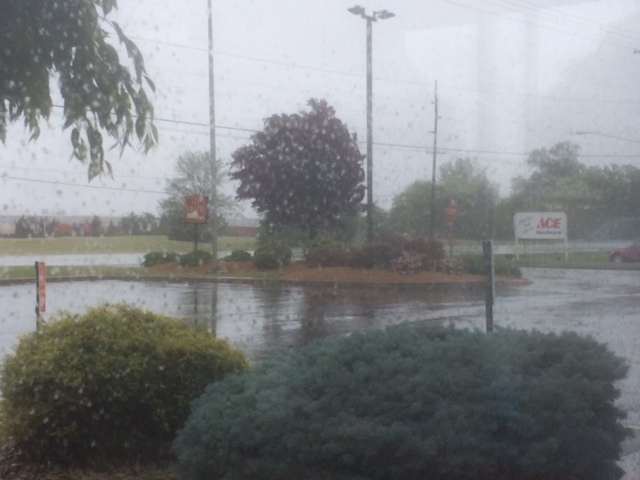 The rain picked up by the time I reached the decision point on the east side of town – side roads or U.S. 20. I decided to stick to the main road, which had a wide shoulder and little traffic. This proved a good decision to Bellevue, as the rain picked up and the wind started blowing hard from the northeast. I weighed all the good attributes of my ride – short distance, flat terrain, good pavement – against the rain and decided I was doing pretty well. Beyond Bellevue I encountered some highway engineers idea of good design – a wide rumble strip down the shoulder that forced me to ride inside the white line. There was so little traffic on the four-lane road that most vehicles gave me a wide berth but a few came awfully close. Then the wind picked up hard and the rain came down harder. A few cross-gusts made my bike shiver, and for the first time on the trip I felt insecure. Once anxiety descends the chance for mishap grows, so I kept a steady focus and recalled my friend Dave Gibson’s wisdom, “You won’t always have fun, but you’ll always feel alive” I certainly felt alive, trying to keep my Surly stable against the thirty to forty mile an hour winds. Fortunately, the next town, Clyde, had a McDonald’s where I could pull off the road for a few hours and watch the storm from indoors. When I entered the dining room, a group of bikers also seeking respite from the storm said, “Whoa, we thought we had it hard.” The rain slowed down eventually. 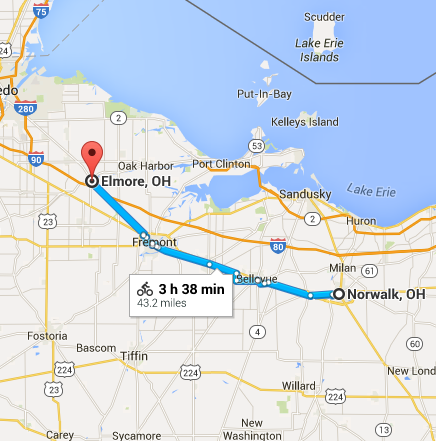 I left after five and rode the last twenty miles to Elmore, all on one of Ohio’s great rail trails, in a list mist. The wind was still strong, but there were no other vehicles to avoid. I arrived at my host’s home about 7:30 p.m. After a warm shower, Gordon served an incredible meal: appetizers and matzo soup, ham loaf with beets and salad, fresh pineapple and blueberries for dessert. We talked until ten and then I slept well under the big down comforter on his guest bed.